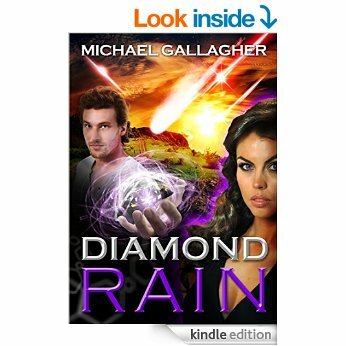 Diamond Rain, by Michael Gallagher, Reviewed. This is science fiction by an author who knows how to tell a story. It’s a complex thriller with elements of the spy genre coupled with a background romance and set in a not-too-distant future on an Earth where nanotechnology has developed in frightening directions. The characters are all well drawn and totally credible. Settings are placed into the story unobtrusively and given enough descriptive detail to enable the reader to imagine where they are. Pace is good and sustained throughout. Whilst a few readers with little scientific knowledge may struggle occasionally with the technology that drives the book, most will find it readily accessible. The book paints a terrifying picture of a near future dominated by a corrupt and greedy leader (so, no surprises there) but does it in an unexpected manner. It was refreshing to read a scifi story not peopled with Americans for a change. I enjoyed the read and recommend it to all those who enjoy a good story. I absolutely loved the very first line – knows how to tell a story. How many times have I opened a book that I thought would be an exceptional read only to get bored in the first paragraph. Nice review. Thank you, DM. I, too, have often been disappointed, especially by those books that have been hyped in the marketing phase. If I can’t get into the story, or don’t care about any of the characters by chapter 3, I don’t read any further: life is too short and there are too many good books out there to waste my time. If I do start a book that I can’t finish, I don’t review it either. I take it Americans are the predominant life form in sci fi, usually? In a lot of SciFi, any human life is often portrayed as from the USA, so this one, using Israel and China predominantly, makes a pleasant change, Noelle.